The day before Thanksgiving Kate Fenelli returns to Valentine Valley, not just to spend the holiday with her family but for a two month sabbatical the senior partners in her law form insisted upon after Kate disagreed with them about a case. Kate grew up in small Colorado town where her parents own Carmina’s Cocina, an Italian restaurant, but Kate was intelligent, ambitious, and eager for a larger world. Not even an early marriage and the birth of a son deterred her from her goals. Becoming a junior partner and being given the responsibility of opening a branch office in Vail kept her immersed in work. Weekends and holidays with her son kept their relationship close. Yet the first person with whom she shares the news of her forced sabbatical is her ex. Tony De Luca is surprised to see Kate walk into his tavern. He’s even more surprised when she confesses her reason for being in Valentine Valley. Because they both love their son, Tony and Kate have maintained a friendly relationship since their divorce nine years ago. Kate even fronted the loan for Tony to buy his tavern, but he is in no way prepared for Kate to become part of his life again. Friends since childhood and a couple from their high school days, Tony and Kate married when Kate became pregnant. They survived four years of marriage, but by the time Kate finished law school, it was clear that Tony’s dream of their building a life together in their hometown was never going to happen. After the divorce, Kate focused on her career, and Tony became a Monday through Friday custodial parent and tavern keeper. Kate’s reappearance awakens anger Tony was unaware of harboring, and he is determined Kate will not disturb the hard-won balance he has achieved. Kate is at loose ends without work to fill her time. She also realizes that, at thirteen, her son Ethan is moving toward independence and may soon resent giving up his activities and plans with his friends to spend weekends with his mother. A foolish bet has Kate working in Tony’s Tavern, and soon the chemistry between them proves as explosive as ever. They agree to a friends-with-benefits relationship, but it is not as easy to keep hearts unengaged as they thought. Kate is rethinking her choices, and Tony is running scared. Will nearly a decade apart and the differences between them prove to be too large a gap for even love to bridge? 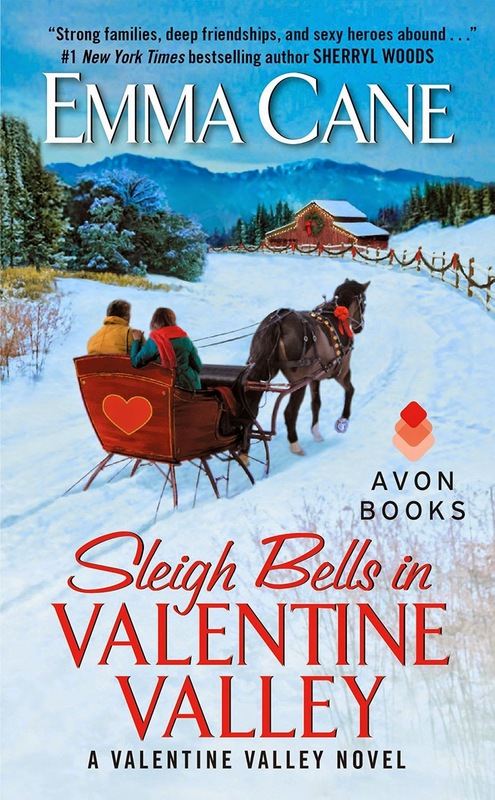 Sleigh Bells in Valentine Valley is the fifth book in the Valentine Valley series of Emma Cane (aka Gayle Callen). The holiday setting with all its associations with family and tradition seems particularly appropriate for this reunion story. The reunion trope is one of my favorites, and this book reminded me of all the reasons I love such stories. Kate and Tony have a long history together, and even divorce could not eradicate their shared memories. Their son Ethan, to whom they are both devoted, is another enduring link between them. Because their marriage truly broke up because of “irreconcilable differences” rather than from indifference or infidelity, the reunion was an easier sale. Both hero and heroine are likeable characters, although readers’ sympathies may align more deeply with one or the other according to individual temperament. Secondary characters are also a decided part of the book’s appeal. Both Kate and Tony have close relationships with their respective families, and Tony has continued to be warmly accepted by Kate’s family even in the post-divorce years. Thirteen-year-old Ethan is a delight. His love of sports, his fondness for technology, his affection for his family (pet included), and the growing importance of friendships in his life all reminded me of the thirteen-year-old I know best. Fans of the series will be pleased with the appearance of characters from earlier books, but readers new to the series will find the book works fine as a standalone. I haven’t read every book in the series, but I have read enough to know that the stories are distinct from one another rather than a retelling of the same story, a major plus in my view. If you like small-town contemporary romances, holiday stories, or romances with a hero and heroine mature enough to have baggage other than childhood trauma, I think you will like Sleigh Bells in Valentine Valley as much as I did. SLEIGH BELLS IN VALENTINE VALLEY has the elements I love - "small-town contemporary romances, holiday stories, or romances with a hero and heroine mature enough to have baggage other than childhood trauma." I have not read any of this series, and am happy this works as a stand alone. It is nice when there is a maturity to the relationship and the story. Reunited lovers is one of my favorite tropes, librarypat, and I really enjoyed this one. I have this one & haven't gotten to it. I read the first book & loved it, but I wanted to read them all in order. Hopefully before Christmas! Thanks for the review. I have read a couple of books from this series and I can't wait to read more of them. Loved the ones I read. I have read her Gayle Callen books but missed her books writing as Emma Cane. I would like to visit Valentine Valley. I love the reunited lovers trope. Looking forward to reading this one. Thanks, Janga! I really liked the earlier books in this series, a couple more than others, and I'm looking forward to reading this one. Thanks for a good review.